It can seem daunting, but if anybody can organize and plan for such an endeavor, it's the varied, resourceful and skilled community of a university or college campus. At Guilford, we first began by getting our administration on board. With us, it was as simple as walking into the President's office and asking for her support, which she readily provided. We then met with the President and some VPs to decide on available housing. At your institution, it might be different. You will need to assess whether your administration will agree without a strategic plan already in place. If not, then you can put a plan together by doing some of the following steps. We then contacted our local refugee resettlement agency (find yours here) to let them know that we would like to offer housing to a refugee family and assist the agency with the work of resettlement. The agencies were happy to work with us and gladly accepted our offer of housing. This particular piece is an essential need and an ever increasing challenge and was especially welcomed by the agencies. From our agency, we received a list of what has to be done for a refugee family before, during and after their arrival. This list includes all the necessary tasks (from setting up a house, to airport pick up, to assisting in employment and everything in-between). It is important to remember that your campus can choose which of these tasks it would like to take on and which it would like to keep to the resettlement agency to do. 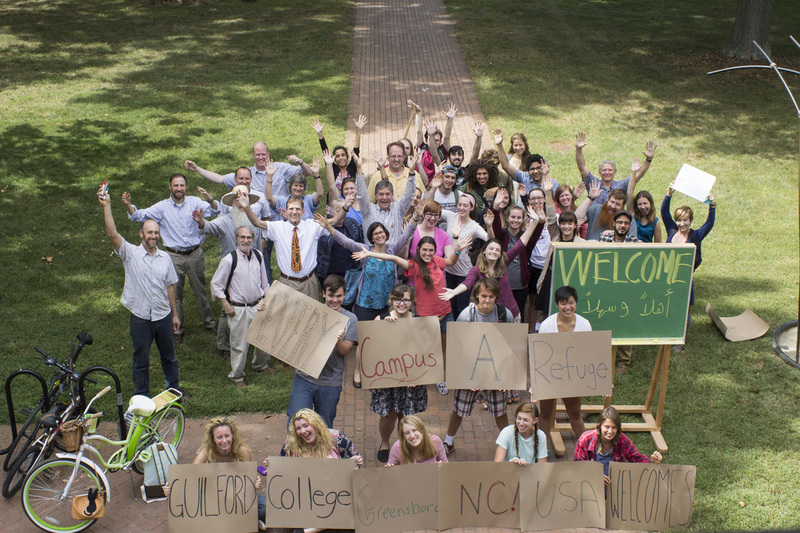 Once we established that we would be helping our local refugee resettlement agency, we reached out to our campus engaged learning office, The Center for Principled Problem Solving. Most universities and colleges have similar programs, offices or departments. These are the offices which engage in service learning, community engagement, volunteering, etc. They were happy to support and house the initiative. This meant that the initiative could have an institutional home and the necessary support (financial and otherwise). This office can also help you connect with local community partners such are your local refugee resettlement agency since they have established relationships with them. Your institutional home might be the President's office or something else. Because of the support, we were able to create a task force which included student workers. This small group will work to assign (through requests) the various tasks on the list which we decide to take on. These can be requested and assigned to the appropriate departments (for example, your campus might have an International Student Office that can take family members to get their Social Security numbers and fill out other similar forms) or to individuals in a pool of volunteers (who can babysit, drive a family member to an appointment, help with grocery shopping). The names of the volunteers (students, faculty, staff, and local community members) is logged into a google doc and is updated regularly (a task which can also be assigned to a student worker). The pool has been growing steadily due to all of the educational events and meetings we've held on campus. We hope that by the time our family arrives, we will have a person or a department designated for each of the tasks we decide to take on. This has been our process, but your campus can do it differently. Your institution might decide to create an ad hoc or steering committee which is tasked with organizing the logistics of the effort. We have found that having funds for student workers really helped. Even if you cannot offer on-campus housing, your campus can offer to pay for the family's rent for those 90 days in an apartment off-campus. You can crowdfund or draw on community generosity for this focused effort. Remember, if all you can take on is housing for 90 days, this is still a huge help to your local agency. If you can help the family find permanent housing and negotiate for them affordable rent at the end of the 90 days, you will have contributed significantly to their adjustment and resettlement for they will not need to spend their one-time stipend on rent and utilities and they can have the time to decide where they would like to live more permanently (which ideally would be closer to their jobs). Find out ﻿here ﻿what we hope to achieve when our family arrives on campus.